Businesses who have data on computers, network drives, online repositories and sticky notes need Doc&Do. Finally, one login to one comprehensive solution to solve all your business management needs. DocAndDo makes it a cinch for you to run your business effectively. 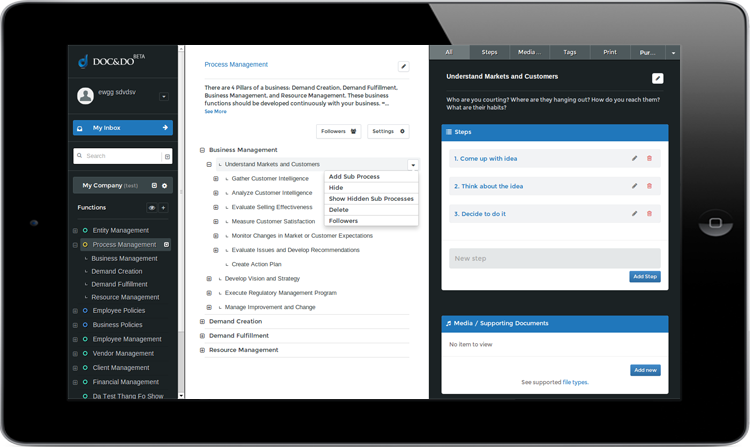 Create and manage Business Processes (SOPs), Employee Training, Company Policies, Files, and much more. Instantly inform Employees, Vendors, Clients, Affiliate Partners, with your time sensitive information the moment an action is taken. Boost your productivity by staying in touch with only the information you need to do your job. No more wading through the reams of information that have nothing to do with you.